After having downloaded the 1.3 GB installation package, I finally got around to installing SQL Server 2012 Express Edition. I was pleasantly surprised that the process for installing SQL Server 2012 went relatively smoothly. For those that remember the process under SQL Server 2008, the wizard that took forever to load would keep sending you to site after site for one prerequisite after another. After installing one prerequisite, you’d have to go through the process from scratch, only to have the wizard tell you that you’re missing something else. Fortunately, nothing like that happened during my installation of SQL Server 2012, but I did get a couple of interesting message boxes along the way. I received this pair of incredibly informative alerts on two separate occasions. After pressing “Retry”, everything seemed to proceed normally, and the database is currently functioning without any apparent problems. I installed a new named instance, though I was given an option to upgrade any instances I had from SQL Server 2005 or 2008. The entire process, however, took more than two hours. I will be the first to admit that the computer I was using was anything but top of the line, but it’s hardly a clunker either. One note for prospective installers and installeresses is that it is my understanding that SQL Server 2012 will not install on Windows XP. If you’re lagging behind on technology, you’ll have to stick with SQL Server 2008. Once the installation process completed, you will first notice that the UI for Management Studio is patterned after Visual Studio 2010. IntelliSense, which is a common feature in recent Microsoft development environments, is also included, as it was in the SQL Server 2008 Management Studio. I find it useful, but annoying at times. I presume that there is a way to turn it off and I’ll find it if I find that it’s getting too annoying for me. My next step was to install Books Online (BOL), but the staple of recent SQL Server versions is now part of the Microsoft Help Viewer. When you first start the Help Viewer after the database engine installs, all you’ll get is a picture of a cow eating grass. To install the full content, start the Help Library Manager and choose Install Content from Online. The installation of the help modules took over an hour. Nonetheless, after a lot of disk grinding, everything installed properly and I have a fully-functional database server complete with local help. If you choose to use a directory other than the one that SQL Server creates during the installation process, however, you will have to manually assign rights to the service on that directory. I copied my .mdf file to a different directory and kept receiving an “access denied” error message. After some digging, I found the service name in the access control listing for the SQL Server data directory, but if you want to assign it manually for any other directory, you must specify “NT SERVICE\MSSQL$SQL2K12”. Replace “SQL2K12” with the name of the instance you specified in the installation. Having heard about the many new features of SQL Server 2012, I’m looking forward to seeing how they work for myself. 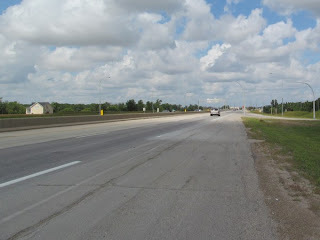 I was on the West Perimeter Highway in the last week and I spotted something that I never thought I would live to see. Not only have the lights been taken down at Roblin Boulevard, but all four lanes are open on the bridge crossing the Assiniboine River. As I stopped to take the picture, I thought that my eyes were playing tricks on me. Fortunately, they weren’t. All four lanes on that bridge are indeed open. 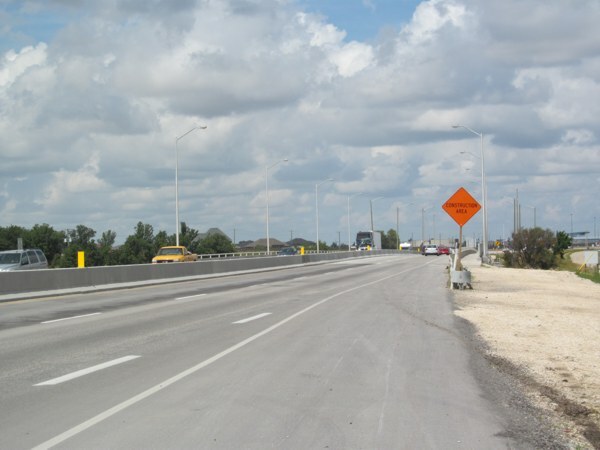 The bridge that has provided quasi-permanent employment for so many workers is no longer a construction zone. Further proof that Armageddon is indeed close at hand. Dripping wet, I sat down at the downtown library on my way home today and powered on my tablet to check my e-mail. Seconds later, a big fat guy comes behind me and starts squeezing his oversize frame between the wall and the back of my chair. He has the entire library to himself, but the call of the chair two seats away from me is too powerful for him to resist. Somehow, he manages to rearrange his expanded girth through that narrow passageway. I make no effort to make it easier for him. While my tablet is powering up, he takes the seat he worked so hard to reach. Finally settled, he begins loudly jabbering to no one in particular. Nothing is too trivial for Big Fat Guy to make a comment on. I finish my business and get up to leave.